After cutting through 8 miles of the late-morning fog on W Hwy 84, riders climbed out of the mist to face sunny skies for the climb of West Old La Honda to Skyline Blvd. After winning the men's division by immense margins during weeks 2, 3, and 4, Tracy "Dominator" Colwell punctured during his ride today. Despite losing over 4 minutes while he replaced his tube, and despite declining to use time-trial bars for the event, he finished among the leaders on the day. Meanwhile, the women's event was hotly contested, with series leader Liz "I'm Fried" Benishin facing some fast competition this week. Rob Schott's report is posted!!! If the above text doesn't appear as orange/yellow on dark blue (color monitor) or white on black (monochrome), click here. Also, consider an upgrade to Netscape 3.x ! To open the second month of the 1996 Low Key Hillclimb Series with Hillclimb coordinator, wear your Saturday best to San Gregorio and join photographer Gordon Good for what may be the toughest climb in this year's series -- West Highway 84 and West Old La Honda. The 1995 Hillclimbs visited Old La Honda from the other side. This year, we check out the more scenic, less trafficked, western slopes. However, there's plenty of riding to be done before they are reached. This is a ride in the tradition of Tour de France "mountain" time trials, where riders typically start a significant distance from the base of the hill. Thus, pure time trialing as well as hillclimbing skill comes into play. Riders begin at the famous San Gregorio Store. From there it is 7.5 miles of net gently uphill, on the aero bars, to Pescadero Road. Since this section, roughly the first half of the day's mileage, is more of a flat time trial than a hillclimb, if possible we will provide intermediate time splits to separate the flatlanders from the pure climbers. Don't hold back, however, to "save your strength" for the climb; the best times will be produced by those who go hard throughout the entire course. After Pescadero, the climbing begins. 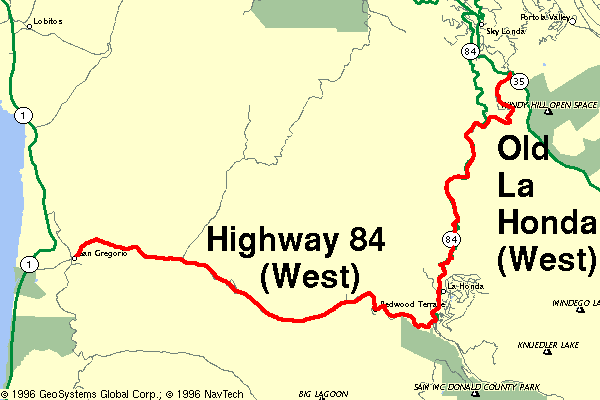 Highway 84 presents the shallowest grades of the entire 1996 Low-Key Hillclimb series. After the long run from the coast, however, your legs will feel every one of the 770 vertical feet in the 3.9 miles to the turnoff onto Old La Honda. Thus you will arrive at the finale -- the 2.6 narrow, twisting, miles amongst the redwoods to the finish at Skyline Boulevard. The views of the ocean as the road hugs the hillside are spectacular, the redwoods which surround you afterward inspiring. However, if you want to be fast, save the admiration of Nature for another day -- after the 11.4 miles preceeding Old La Honda, all your resources will be focused on your legs, your lungs, and the section of tarmac in front of your wheels. Do you have what it takes to push yourself to your limits for the full distance? Find out. Finish: intersection of Old La Honda Road and Skyline Blvd. 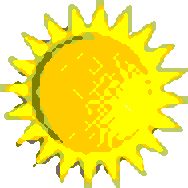 Weather: Low-50's F at the start with fog; High-50's and clear at finish. Light wind. Statistics are from data by Bill Bushnell.